It’s wondrous how the vast and the infinitesimal combine to make our planet work. Scientists at Woods Hole Oceanographic Institution (WHOI) have found that bacteria in the ocean, gathering in sort of “microbial block parties,” communicate and cooperate with each other to have a significant impact on how carbon dioxide is transferred from the atmosphere to the deep sea. In this newly discovered mechanism, bacteria coalesce on tiny particles of carbon-rich detritus sinking in the ocean. 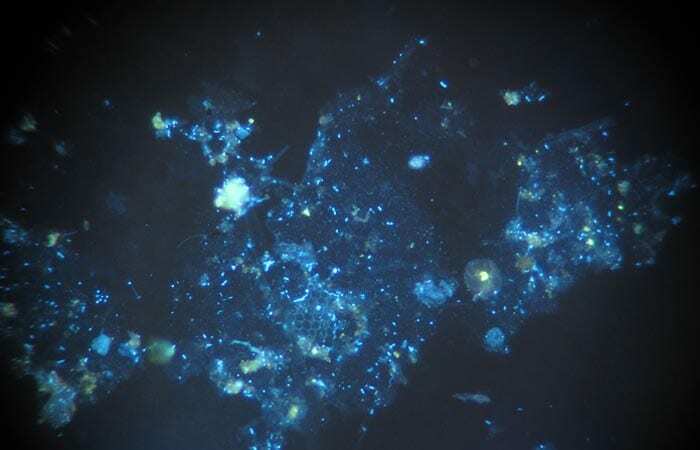 They send out chemical signals to discern if other bacteria are in the neighborhood. If enough of their compadres are nearby, the bacteria en masse commence sending out enzymes that break up the particles into more digestible bits (see interactive). As a result, a substantial amount of carbon does not sink to the depths, which affects both the marine food web and the planet’s climate. The re-released carbon can be reused by marine plants, and less carbon dioxide, a heat-trapping greenhouse gas, is drawn out of the air into the ocean. In addition, less carbon is effectively transferred to the bottom of the ocean, from where it cannot easily return to the atmosphere. The finding represents the first evidence that bacterial communication plays a crucial role in Earth’s carbon cycle. 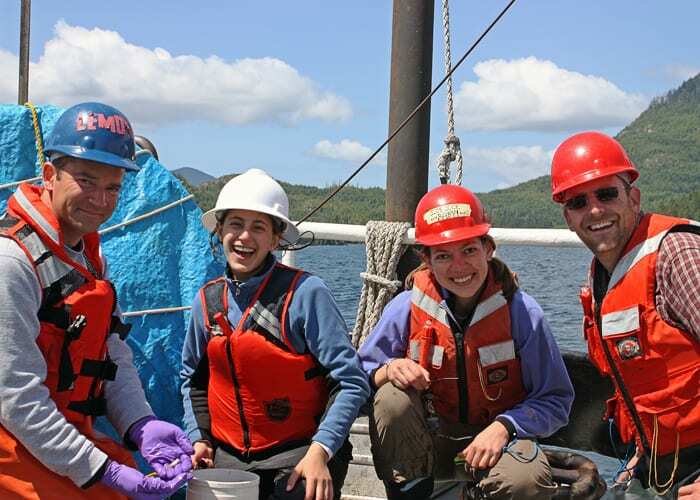 It was reported in the Sept. 29, 2011, online issue of Environmental Microbiology Reports, by WHOI marine biogeochemists Laura Hmelo, Benjamin Van Mooy, and Tracy Mincer. The bacteria can manufacture enzymes to break down the molecules, but here’s the catch: It costs precious energy to make the enzymes, and a lone bacterium doesn’t stand a chance. Instead, the bacteria conserve their resources by making other chemicals, called acylated homoserine lactones, or AHLs, which cost much less energy to produce, Hmelo said. They send these AHLs into the environment to see if any other bacteria are around. If no other AHL-producing bacteria are in the vicinity, the AHLs will diffuse away and quickly degrade, and bacterial “silence” will prevail. But if enough AHL-producing bacteria are nearby, the concentration of AHLs outside the bacteria will eventually rise. That’s the chemical signal to each bacterium that it’s got a lot of buddies in the area. In this way—a process called quorum sensing—the bacteria sense that they have achieved a quorum, in this case a sufficient density to begin to make and release enzymes. 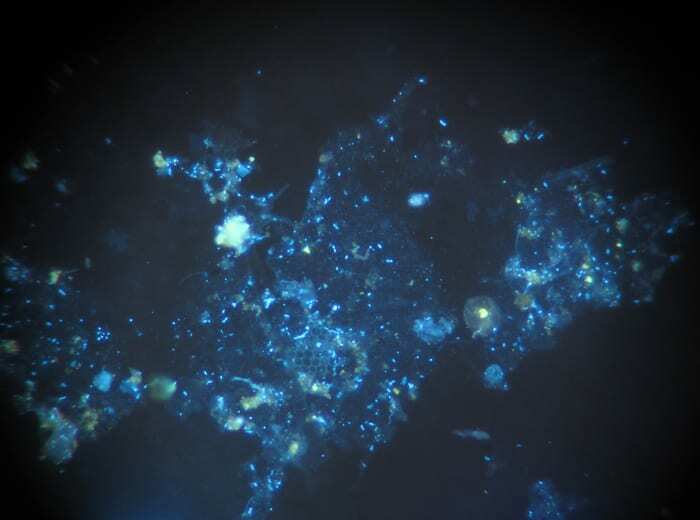 You might think of it as the microbial equivalent of sending out tweets to organize a block party. 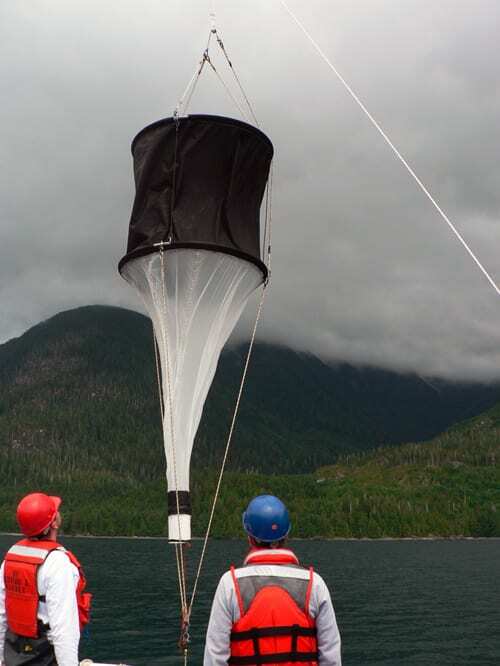 The scientists investigated this unexplored mechanism by using mesh traps to collect particles of marine snow sinking in Clayoquot Sound off Vancouver, where fjords extend into the ocean. Tides go back and forth over the shallow bottoms of the fjords, stirring up nutrients that spark blooms of marine algae. Back in the lab at WHOI, the scientists incubated the collected particles and confirmed the presence of AHLs in the marine snow. They also added AHLs to samples and found that the chemical signals stimulated bacteria to make enzymes that broke apart the particles—confirming that bacteria “talk about it” before launching a coordinated assault. In the natural world, Van Mooy said, only about 10 percent of particles makes it all the way to the ocean depths; the scientists theorize that this quorum-sensing mechanism plays a key role in disaggregating most of the particles.